As part of the NERC Oceans 2025 programme in 2007, PML were awarded a capital grant to build autonomous buoys for the long-term stations at L4 and E1. 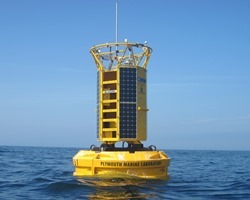 Originally both L4 and E1 were populated by the same design design buoy constructed by Hippo Marine with systems design and integration carried out by PML. However, during 2012 the opportunity arose to collaborate with the UK Met Office who were rolling out a new hull design to replace their 30 year old K-series. At E1 the hull, moorings, meteorological and wave sensors (these integrated using a Watchman Axis logging unit) are now provided by the Met Office and the in-water sensors by PML. The in-water measurements include: sea surface temperature, salinity, oxygen, turbidity, fluorescence (WetLabs WQM)); CDOM fluorescence (WetLabs); nitrate (Satlantic Suna) and a PAR sensor (Satlantic). Both systems report to shore hourly using Iridium Short Data Burst format. The E1 buoy normally reports current position using AIS. The latest in-field data are shown in the table below.